This week we learned about parabolas and how they can be translated on a graph. Depending on the equation, you can determine where the parabola has moved on the number line. 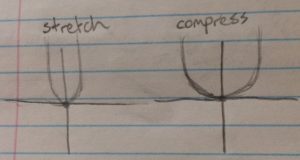 If the coefficient of changes, the parabola will either stretch or compress. A coefficient less than 1 will cause the parabola to compress, while a coefficient more than 1 will cause it to stretch. 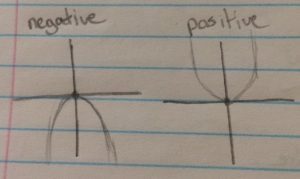 If the coefficient is negative the parabola will open down, while if it’s positive it will open up. 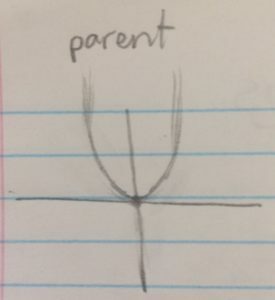 In the case that your equation looks similar to , with your numbers in brackets, then the “c” will effect whether your parabola translates left or right. If the number is positive, it will translate left, and if it’s negative it will translate right. 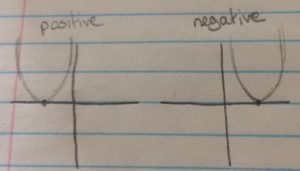 It does not follow the general idea that negatives go left and positives go right.